Northern bottlenose whales are about 3m long at birth. There is a big sexual dimorphism in this species, with females reaching 8.7m in length, and weights of 5800kg; but males are a lot larger reaching 10-11m in length and weights of 7500kg. Life span is, at least, 37 years. 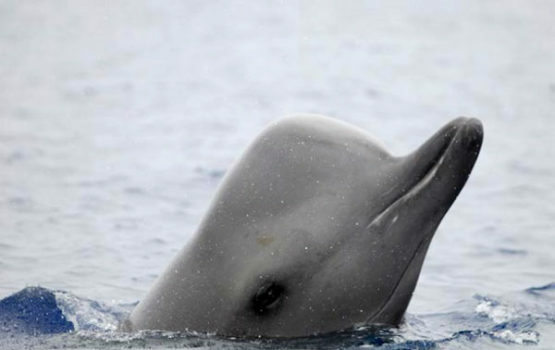 The northern bottlenose whales are a long but robust animal with a pronounced beak and a large melon. Adult colouration is countershaded: the back is mid- to dark grey and the belly lighter. There are scars on the body that become more extensive with age. 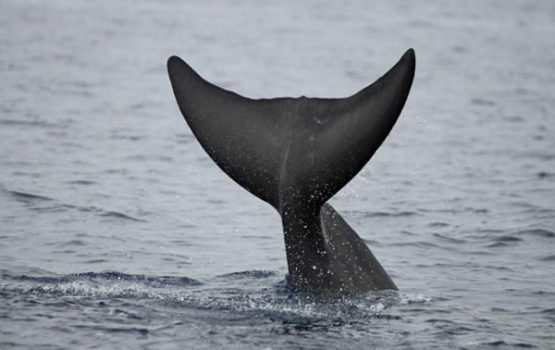 The dorsal fin is high (about 30cm), falcate, and situated well behind the middle of the back. The head of adult males is white and flattened in front, while that of females is grey and more rounded. The females also have a white neck collar behind the blowhole. There are two teeth at the tip of the lower jaw, which erupt only in mature males; in some individuals these teeth are not always visible outside the closed mouth. Although primarily adapted to feed on squid, the diet of northern bottlenose whales also consists of fish, sea cucumbers, starfish and crustaceans. 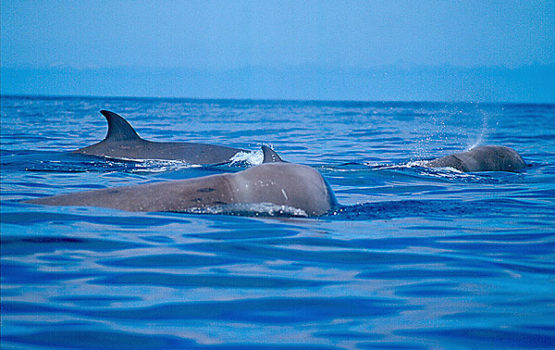 Groups of northern bottlenose whales average about four individuals, and few groups contain more than ten individuals. There is some segregation, as groups can consist exclusively of mature males; females, and young; or a combination of the two. An unusual feature of this species is the tendency they have to approach stationary or slow-moving vessels; but the same doesn’t occur for fast-moving boats. Their behaviour at the surface can change rapidly from moments of quiet, occasionally spyhopping, to erratic bursts of rapid swimming in different directions. In the Azores, very often they switch between short dives (up to 10min), and long dives (more than 30min). The northern bottlenose whales are found only in the North Atlantic Ocean, occurring mainly in cold temperate to subarctic waters. Some populations are resident, and this is one of the best studied species of beaked whales due to their permanent presence in the Gully (Nova Scotia). The furthest south of their range seems to be the Azores and the Iberian Peninsula, although there was a recent, confirmed sighting of this species in Madeira. They are not a coastal species, occurring only in deep water habitats, but vagrant, perhaps disoriented individuals have been seen close to shore, like in January 2006 when an individual female was seen in the river Thames near London. This is the largest beaked whale species in the North Atlantic. 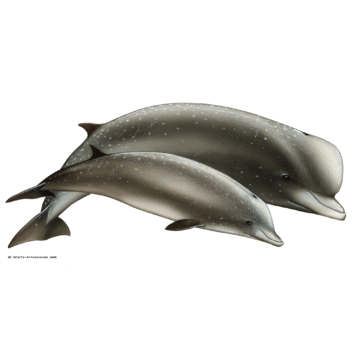 At a distance, the only other species that could be confused is the Cuvier’s beaked whale (Ziphius cavirostris), because of their larger size and also possessing a white head. However, the much shorter, not well defined beak should make this later species, easy to distinguish. 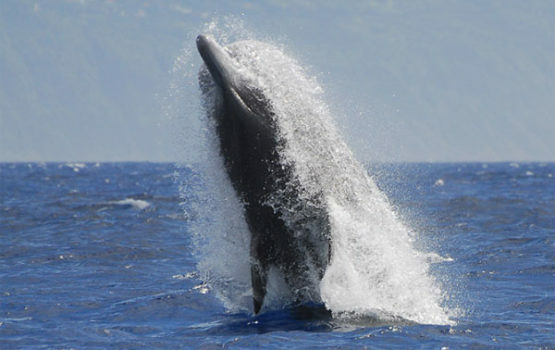 Northern bottlenose whales are a seasonal visitor to the Azores and we spot them, every summer, usually in July and August, although sightings of this species have occurred in September and October; however, they have never been seen prior to July so far. It is not clear why these animals visit the archipelago but they can remain in the area for a few days up to a few weeks. There also seems to be a subtle variation on the frequency of the sightings of these individuals throughout time. Until date, the best year was 2009, when we had 34 encounters with bottlenose whales.